Sumada, Reiko "Rei" Taguchi Reiko died on Mar. 10, 2019. She was born in 1926 in Seattle, WA, the youngest of five children. 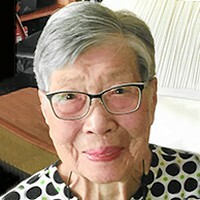 Her family was interned at the Minidoka War Relocation Center during the Second World War. She later moved to Rochester, MN where she completed high school. She graduated from the University of Minnesota, where she met her future husband, Tsuguo. They married in 1951 and made their home in St. Louis Park. Reiko enjoyed sports and played in a women's golf league well into her 80's. Over the years, many friends have been recipients of her beautiful handmade greeting cards. She was active in the Japanese American Citizens League through which she sustained many long-term friendships. She served as a science paraprofessional at Westwood Junior High School in St. Louis Park. Reiko is predeceased by her husband, her three brothers and her beloved sister, Kimi Hara. She is survived by her sons, William (Linda Fisher) and Robert (Martha); nephews Thomas Hara (Kathy) their children Elizabeth and TJ Hara; Mark Sumada (Pam), and Mark's children Zachary and Benjamin; nieces Lisa Taguchi and Susan Sumada. She maintained a loving relationship with Zach's and Ben's mother, Sandy Grove. A celebration of life reception will be held at the Lakewood Cemetery Garden Mausoleum on March 25, 1-3PM. Private burial at Ft. Snelling National Cemetery. Memorials to Minnesota Nikkei Project.